Claire Baldwin is a Nottingham-based copywriter with a specialism in writing for digital. 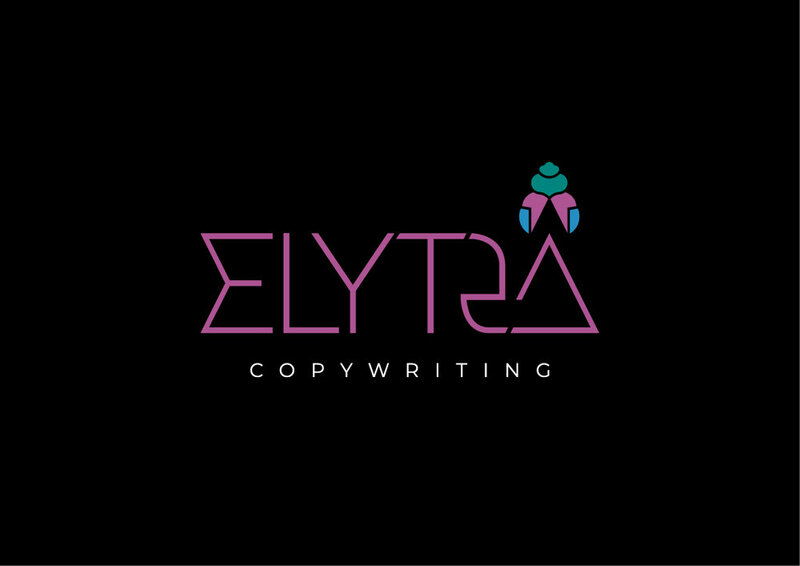 After working as part of an in-house team client side, as well as at marketing agencies based in the East Midlands for over 10 years, she set up her own freelance copywriting business called Elytra Copywriting. She primarily works with small businesses who don’t have the time or resources to write themselves. She is dedicated to providing a fairly priced, professional service for her clients. Claire required a logo for Elytra Copywriting and approached DWH for the design. She already had a clear concept of what she wanted but required our design service to see this through to a refined, professional brand. Claire is a big fan of ancient Egyptian history and her idea was to use the symbol of the scarab beetle, which symbolises the restoration of life. The scarab was a popular design for good luck charms, for seals used to stamp documents, and for jewellery made from clay or precious gems. After our initial discussions, we took her supplied mood board as a start point and began sketching and refining the scarab beetle to create a bespoke icon for her business. We then did some research which centred around Egyptian typography. Despite there being a wide range of fonts we could choose from, we couldn't find anything for the Elytra wordmark that complemented the style of scarab... so we created our own! The end result was a custom typeface called Elytra Sans. This enabled us to create a wordmark that works organically with or without the scarab. This also enabled us to create two versions of the scarab. One with the wings open as if in flight and one that is closed that can be used in isolation, for example, on social media profile pictures or on the back of the business cards with the strapline. As a result, Claire has a logo that is unique, flexible and has its own tone of voice to complement the service that she provides. "DWH really went above and beyond to design my logo and finalise a colour palette for my brand. I had quite a clear concept of what I wanted but lacked the skills to make something professional myself. DWH took my initial ideas, crude sketches and reference images, and used them to create exactly what I was trying to achieve. I'm completely in love with my logo and the scarab icon, and lots of people have said how great they look. I can't thank DWH enough for making me feel like a legitimate business with my own clear identity."